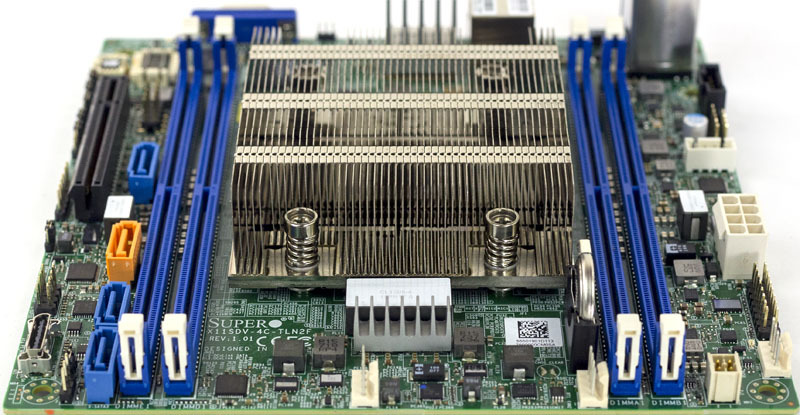 The Supermicro X11SDV-4C-TLN2F is an awesome mITX platform. Compared to the previous generation Supermicro X10SDV-4C-TLN2F, it follows Intel’s product direction, adding new capabilities. We have been testing the platform for several weeks now and highlighted it in our Exploring Intel Xeon D Evolution from Xeon D-1500 to Xeon D-2100 piece which discusses many of the platform-level features using this motherboard as one of the data points. 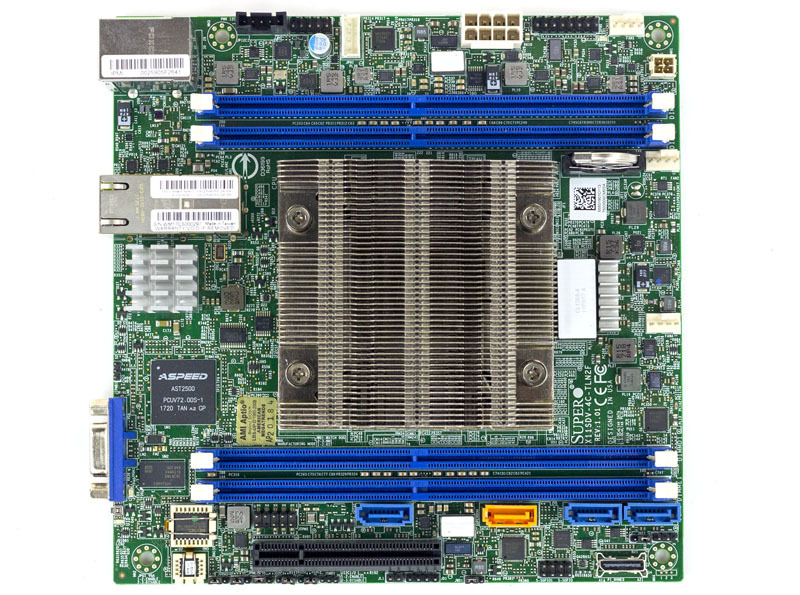 At its most basic form, the Supermicro X11SDV-4C-TLN2F is a mITX motherboard. That means it fits in the same 6.7″ x 6.7″ form factor that we have seen for a few generations of Supermicro embedded products now. 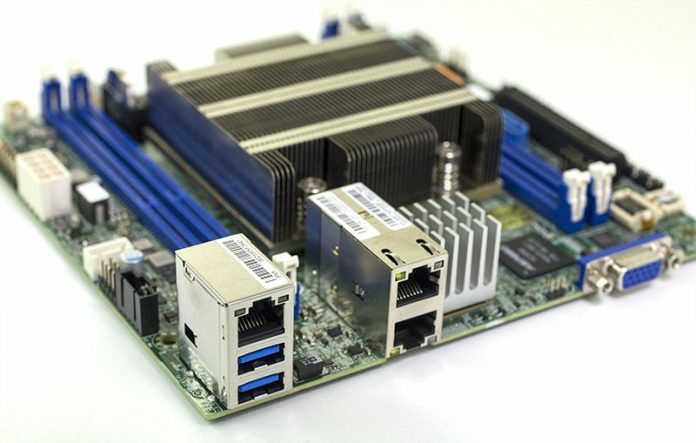 Completely dominating the motherboard is the heatsink around the Intel Xeon D-2123IT SoC. This is a passive unit but with a 60W TDP SoC, it will require airflow over the unit to operate. Under the heatsink is an Intel Xeon D-2123IT SoC with 4 cores and 8 threads running at 2.2GHz base and 3.0GHz turbo clocks. These are the same cores as the mainstream Skylake systems so you will see feature set compatibility. That includes advanced features such as AVX-512 as well. Beyond the raw CPU capabilities, there are a number of system-level capabilities with the new platforms that we will highlight in this overview. 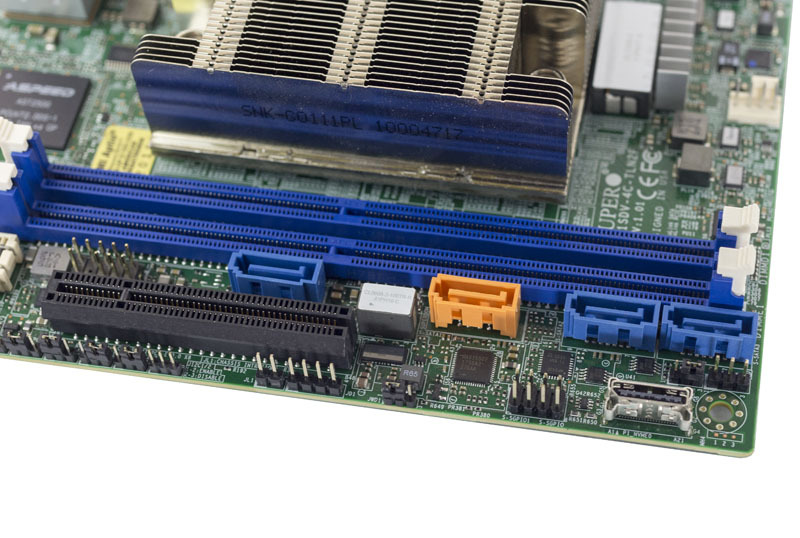 Like the X10SDV series, the X11SDV-4C-TLN2F has four DIMM slots. The main difference in this generation is that each is tied to a memory channel of the onboard Intel Xeon D-2123IT SoC. That essentially gives twice the memory bandwidth (or more) versus the Intel Xeon D-1500 series. You can still use as few as one DDR4 RDIMM, but we suggest fully populating all four channels. Memory capacity is rated at 512GB using LRDIMMs or 256GB using 4x 64GB RDIMMs. Storage on the X11SDV-4C-TLN2F is significantly upgraded over the previous generation. There are four standard SATA III ports, one is gold for using SATA DOMs without a power cable. An additional four SATA III lanes can be appropriated from the Oculink port. That same Oculink port can also be set to provide a PCIe 3.0 x4 link to a device such as a U.2 NVMe SSD. Aside from the Oculink port, expansion is possible through the PCIe 3.0 x8 slot for additional NICs or storage. The other major chips we find are the ASPEED AST2500 BMC and supporting memory along with the PHY for the NICs. These take up real estate on the small motherboard but are necessary for the platform to function. 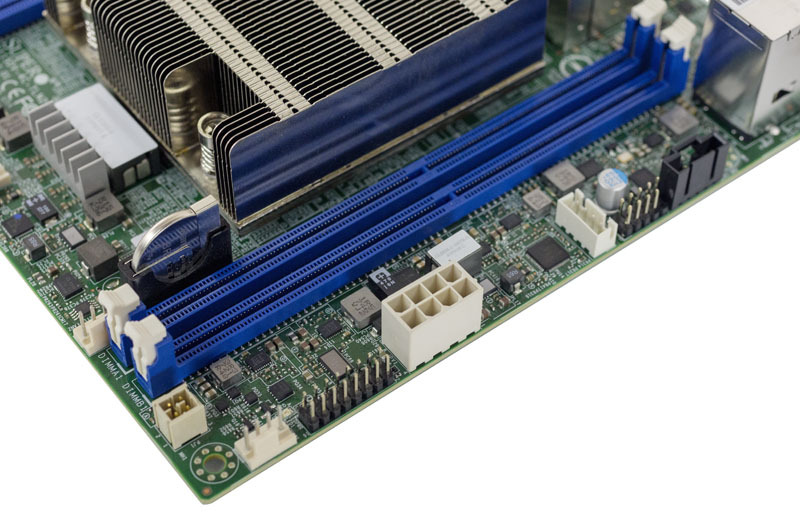 The sheer size of the thermal solution and Xeon D-2123IT footprint means that there is no room for a m.2 SSD slot, an internal USB Type-A header, nor a full-length PCIe 3.0 x16 slot in this generation in the mITX form factor. The rear I/O follows a familiar pattern. First, there is a RJ-45 Ethernet port for remote IPMI management. The rear I/O pattern also has a VGA port and two USB 3.0 ports for local management. There is an internal header for two USB 2.0 ports, but there are no USB 2.0 ports on the rear panel. Perhaps more exciting are two 10GbE ports for 10Gbase-T connectivity. The ports are powered by the X557 NIC and utilize the standard Intel i40e driver. We found compatibility in current Linux and even VMware ESXi 6.5u1 excellent out of the box. One area we wanted to talk about is power. Gone from this generation is the standard ATX power connector so you need to use the 12V DC input. If you do not have a DC power supply, the process essentially involves using the auxiliary CPU power connector and then a cable or assembly to ensure the ATX connector’s power on pins are connected. Supermicro will be shipping these boards with an appropriate cable, but we had to jump the ATX power connector. Next, we are going to look at the Supermicro IPMI management solution. Can’t wait for AMD’s Embedded Epyc to hit the market. Hopefully that will drive perfromance plus I/O up and prices down. I don’t really understand why idle watts are so high. I would almost guess SoC doesn’t reach its deepest power saving states, which should be fixed after kernel support matures. I second the yearn for AMD Epyc Embedded boards. Beside that, looking at the charts above, the best bang per watt and bucket still seems to be at Atom C3955. At least for my usage scenario and feature set needs. I would say kernel support should be pretty solid since it’s based on the Skylake Platform and Intel usually gets their drivers in pretty early. Maybe using acpi-cpufreq instead of intel pstate helps, I usually use the schedutil governor on my Intel devices. However I don’t know how many of the other platforms also have out of band management, I believe that AST2500 is also drawing some power. What I would really like to see is a similar platform that offers more PCIe lanes and/or better networking in the SoC. I would be shocked if they were that high for the 4C models. Pricing looks to be around $700. Does anyone know where to get an OCulink to 4X SATA cable? Thank you for the review! I have a quick question for you – do you think that a GPU would fit in the PCIe slot? And if so, is the slot in the right position for a typical mITX case? Likely the correct position. It may depend on the GPU used in terms of space. Would anyone know what the status of the X11SDV-4C-TLN2F mobo is as of June 2018? It’s quite hard to find anywhere, and some stores even listed as discontinued. Is this a product that you’d still advise buying? Thanks for the quick reply! So do I, but at wildly varying prices, and unavailable at some major retailers like Amazon, with some of them listing the item as discontinued. That’s why I was wondering if there was something wrong with the item, e.g. 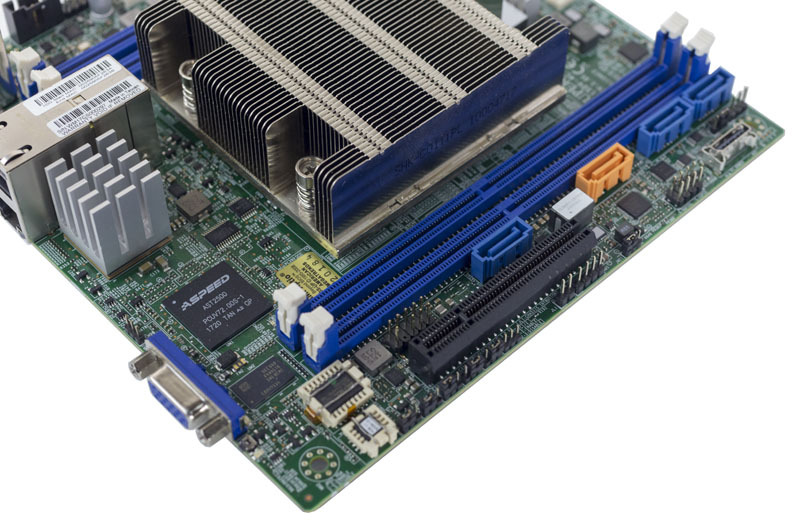 if it’d been recalled due to some defect or something, because I find it odd that Supermicro would discontinue an X11 mobo (if it actually did) when most (if not all) X10 mobos are still available for purchase almost everywhere. Do you happen to know anything about that? Thanks! Hi Juan – I have not heard of a D-2100 issue to date. Amazon is not a primary retail outlet for SM gear. Often if you look at secondary retailer pricing it is wildly different. Thanks for the info and confirmation. I feel more confident now purchasing this mobo. If I may throw another question at you about this board after a while… what case did you use it in? I wanted to use it for a cold storage & backups NAS (i.e. low activity, hardly any more than receiving hourly ZFS replication streams and bi-monthly pool scrubbing), so I was hoping to put it in Supermicro’s CSE-721TQ-250B Mini-Tower, which I understand you’ve reviewed separately. But Supermicro itself told me this was a bad idea because that case would not be able to handle all of the undissipated heat generated by the built-in chip & the provided passive cooling, recommending that I stick to prior generation’s X10SDV-4C+-TLN4F equivalent, which is actively cooled. I don’t care much for 4 NICS, but I do for 10GbE networking (and storage performance, which if I read you right in this article, you say it’s been improved in the X11). So, with that in mind, what chassis would you recommend for this board? Or, alternatively, what alternative board would you suggest? Hi, I bought mine at Provantage. I received it about 3 weeks ago. The board is outstanding. Very happy with it. Quick question – since this doesn’t have M.2 how exactly do you hook up internal SSD storage via Ocusync? Do you just get a 2.5″ SSD and order the Supermicro OCuLink to U.2 PCIE SFF-8639 with Power Cable (CBL-SAST-0956)? If so then you need to buy the super pricy SSD with u.2 connection because most have SATA? or do you need to do the above cable AND buy an M.2 plus StarTech.com M.2 to U.2 Adapter? Seems hokey. U.2 is the better standard. It allows features like NVMe hot swap and backplanes. You can also get power loss protection in large capacity SSDs with U.2. You are right that not supporting M.2 directly means using consumer SSDs in your server is harder. U.2 is the better standard for a server. Price wise, check the STH forums. Usually one can get U.2 drives for about the same as M.2 but with more features. I am using CSE-721TQ-250B and my biggest issue right now is actually the power. The case doesn’t come with an 8pin ATX. Just 2 4-pins. It will boot with just the 4pin plugged in but it keeps having the server shut off randomly. Is there a DC PSU that is recommended? Would the stock 250w power supply be enough for this board? i just want 5000-7000+ passmark CPU on a dual NIC board that PFsense will run on that doesn’t cost a kidney.